Emergencies happen for chief executives that wipe their calendars clean. Tuesday, Gov. Larry Hogan had planned to sign scores of bills, including a package to make Maryland more business friendly. He was to speak to Professor Rick Vatz’s class on persuasion at Towson University in the afternoon, and then he would announce that McCormick, the spice maker, was to keep its international headquarters in Maryland — an important business goal. He would then take questions at a Baltimore Sun newsmaker forum back at Towson. None of that will take place. Hogan had not planned to talk to President Barack Obama on Monday, and the president did not plan to be talking about riots in Baltimore with Hogan and his new attorney general on her first day on the job. And Baltimore Mayor Stephanie Rawlings-Blake had not expected to have the last 10 days, and likely the next 10, turned upside down. UPDATE 4/28, 7:45 a.m.: Gov. Hogan is scheduled to meet with State Police Superintendent William Pallozi and National Guard Adjutant General Linda Singh, two people he appointed, at the Western District police station in Baltimore. Then he will head to the Mondawmin subway stop before meeting with faith and community leaders at his downtown Baltimore office. 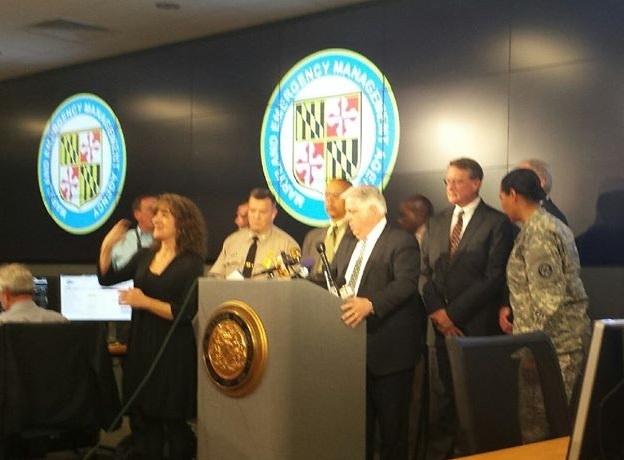 At a Monday news conference, Hogan was asked when the last time the National Guard was called out in Baltimore. Obviously excluding the many weather related emergencies over the years that bring governors to the emergency command center in Pikesville, Hogan replied it was 1968. That was when a Republican governor named Spiro Agnew called out the National Guard to deal with the much more serious riots, looting and arson that devastated some of the same Baltimore neighborhoods after the assassination of Martin Luther King. It was Agnew’s strong law and order response to those riots, including sharp criticism of local black leaders, that brought him to national prominence. This captured the eye of Richard Nixon, who chose him to be vice president, just six years after Agnew gained his very first elected office as Baltimore County executive. This is simply a bit of historical context, not a suggestion that Hogan has any kind of political game plan in mind. Hogan has largely been supportive of Rawlings-Blake over the past week. But he did suggest he was impatiently waiting her call Monday to declare the state of emergency that allows all manner of state resources to be put in place. The unrest immediately brushes aside the arguments over budget and bills that ended the legislative session two weeks ago. There is certainly no question at this point of the governor overstepping his bounds. Not after watching hours of coverage of mobs looting stores and setting police cars ablaze with a phalanx of Baltimore City police up the street, for some reason unable to stop the looting or even protect the firefighters that came to put out the blaze. Nobody knows how this will play out over the next few days. It is the kind of emergency that tests the mettle of any mayor or governor. There is little to prepare a new governor for such a crisis, especially one that will finish his first hundred days in elected office on Thursday.